SPONSORED BY CREATIVE TIME, NY 1984 AND 2004. 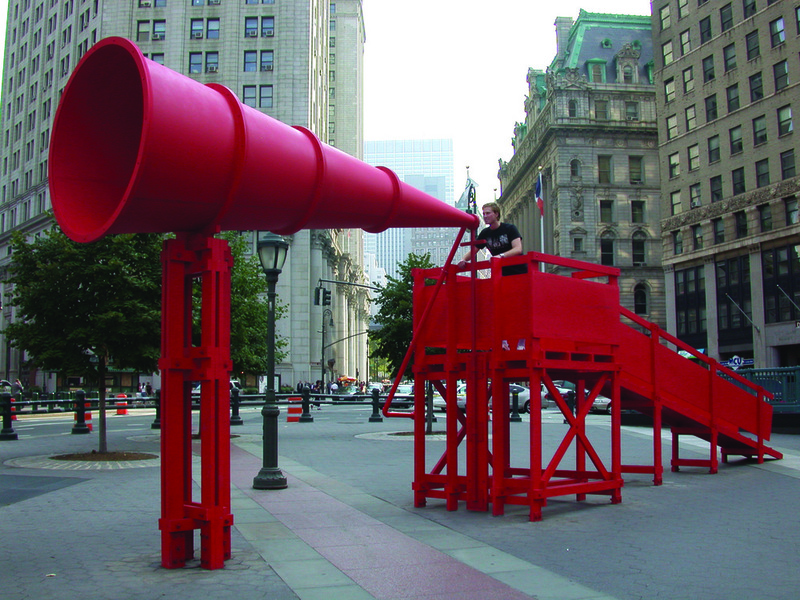 Inspired by the concept of a soapbox, Freedom entices passersby to climb its gently sloping ramp and embrace the megaphone to voice their thoughts, poetry, grievances, and hopes. Providing a public forum for dialogue on the dynamics of free speech, power and powerlessness, and a multiplicity of social and cultural concerns, the artwork engages individuals and groups to use the space in the tradition of a town square. It is both celebratory and ironic and directly addresses public frustration over getting its voice heard. Originally installed in 1984 for Art on the Beach (1978-1985), Creative Time’s annual program that featured collaborations between architects, performers, and visual artists on the Battery Park City Landfill, Freedom captured the imagination of New Yorkers. For one memorable summer, thousands seized the megaphone on the windswept beach to speak their minds to the world. Freedom brought contemporary issues to the fore—from the AIDS pandemic to homelessness in New York—and asserted the importance of standing by our right to express ourselves. The artwork also provided the community with a platform for song, poetry, and performance. I put a taste of what's inside the library on the outside in the form of quotes about reading, both reverent and irreverent. This project was named one of the best public art projects of 1998 by ArtNews magazine. 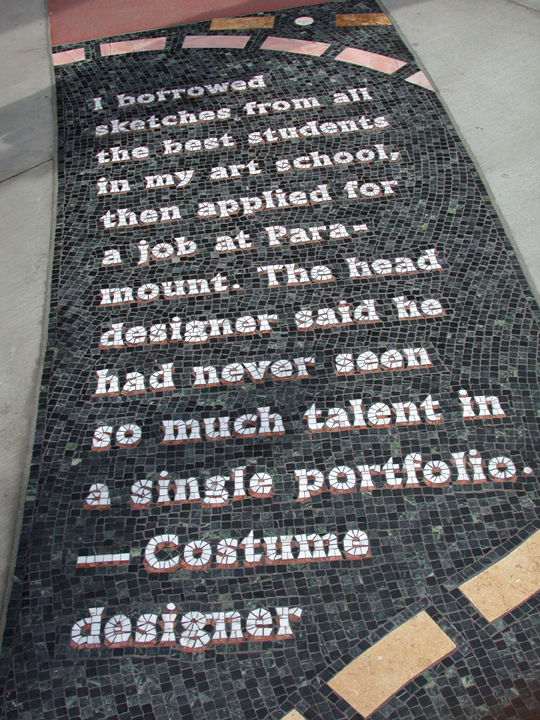 The Road to Hollywood is a marble mosaic and concrete floor piece continuing Hollywood's famous floor tradition—Mann's Chinese, Walk of Fame, etc.—snaking hundreds of feet through a development in Hollywood called Hollywood & Highland, the new venue for the Academy Awards Celebration, right next to Mann's Theatre. The artwork contains 49 stories of how different people in the entertainment business came to Hollywood and began their careers. The stories were gathered through interviews, books, articles and the Academy of Motion Picture Arts & Sciences Library collection of oral histories. The Road ends at Highland Avenue at an oversized chaise lounge made of glass-reinforced concrete over a steel frame. An entire family can sit on this lounge and have their picture taken with the Hollywood sign in the background. 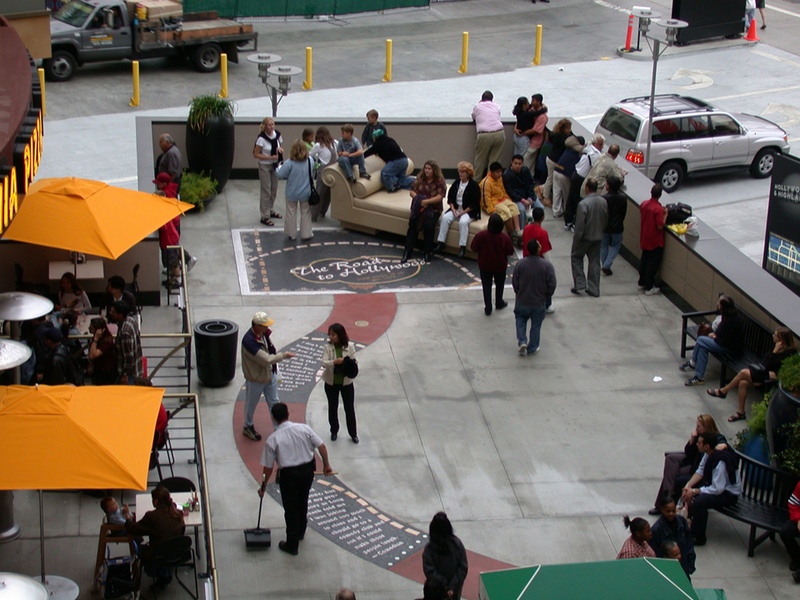 Christopher Knight, writing in the Los Angeles Time, called The Road, "an exceptional work of public art…it ranks among the best public art projects in L.A."
Local residents, picked by lottery, were immortalized in cement, much like Graumann's Theater in Hollywood. 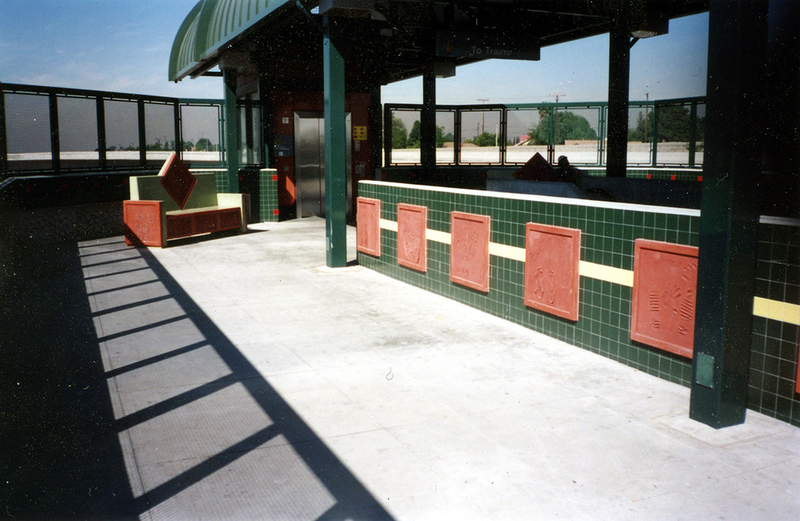 Concrete panels containing their signatures, hand and footprints were placed al over the station -- on walls, benches, even trashcans.